A few months ago I shared some tips for slowing down and finding rest. I’m still working on that. Really, I am! The problem is that there are bills to pay, dishes to wash, laundry to clean, kids to take to therapy and dance lessons and church activities and playdates, laundry to fold and put away, meals to prepare, grocery shopping to do, more bills to pay, and lessons to teach! It’s so easy to get overwhelmed and sucked into the dailiness of life, to get caught up in the stress of having too much month at the end of the money, diapers to change, bottoms to wipe, puke to clean up, floors to mop, bathtubs to scrub, and trash to take out. We need some perspective. We need to focus on the eternal. I have been convicted of that as I watch the news reports of the Arkansas tornado that devastated communities a couple of hours north of us on my younger daughter’s birthday. Foundations are bare. Piles of debris are stacked around what used to be neighborhoods. Families are attending funerals instead of birthday parties. The communities ache. Actually, the whole state is heartbroken. I have prayed for peace and comfort, for strength to rebuild. And then I was rocked by a mama named April. April has a bare foundation. April’s possessions are in those piles of rubble and strewn across central Arkansas. April is in a hospital room, and she has two funerals to plan. Her boys are gone, and it looks like God planned it that way. But April has what I don’t have. I would be angry, like the person who shared April’s story. April, on the other hand, while she still has a lot to process, has unshakable faith in her God—that He is good and has a plan, even when she can’t understand it. She rejoices in her children’s freedom from the brokenness of this world and in the fact that she will see them again one day. I need that kind of faith. I want it. I’m tired of fretting and being anxious about everything. There is something beautiful in complete surrender to the Father and His will, even when it makes no sense to us, even when it’s painful. To get that faith, to come to complete surrender, we have to keep things in perspective. This world is not our home. God is working behind the scenes, doing things we can’t begin to imagine. And He’s preparing us for eternity. 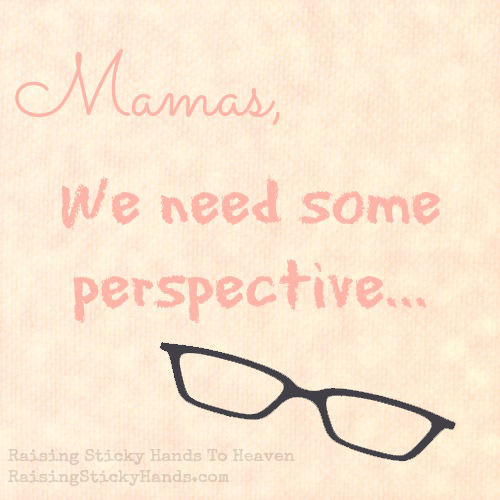 Mamas, why don’t we give ourselves a gift this Mother’s Day. Let’s give ourselves the gift of perspective. With it, we’ll get a peace we never dreamed possible, even in the darkest of times.